No, your eyes don’t deceive you. Blue jeans are getting greener—figuratively speaking, anyway. It was only a matter of time before the humble workwear staple-turned-fashion essential reinvented itself. As shoppers begin to look askance at products that don’t dovetail with their values, denim’s reputation as a resource-hungry pollution powerhouse hasn’t served it well. Environmental groups like Greenpeace have long flogged indigo dyeing for transforming the world’s once-pristine waterways, from the Pearl River Delta in China to the Citarum River in Indonesia, into fetid broths of heavy metals and other hazardous substances. Sandblasting, a technique that distresses jeans by pummeling them with abrasive crystalline silica, often in the absence of adequate ventilation, can cause severe respiratory problems for workers, resulting in fatal diseases such as silicosis and lung cancer. Even cotton farming itself is an inordinately thirsty and chemical-intensive beast. Although the fiber accounts for 2.4% of the world’s cropland, according to industry figures, cotton uses up 24 percent of pesticides and chemical fertilizers. About half of the 2,000 gallons of water that goes into a pair of jeans stems from cotton agriculture. All of which is to say, denim’s evocation of blue skies and open prairies doesn’t come without its tolls. Slater and Moore eventually changed their tune, debuting in August a line of jeans that bears, as part of its name, the acronym S.E.A., which stands for Social Environmental Accountability. True to Outerknown’s commitment “to people and planet,” the jeans incorporate a form of organic cotton—that is, non-genetically modified cotton, grown without the use of synthetic chemicals—that guzzles 90 percent less agua than conventional cotton. The brand trucks the stuff from two of “the best mills in the world”—Candiani in Italy and Isko in Turkey—to Saitex, a LEED-certified denim facility in Vietnam that recycles 98 percent of its water back into its production and turns the remaining 2 percent into sludge for making bricks to build affordable housing. Just as virtuously, Saitex runs its operations on solar power, harvests rainwater and air-drys 85 percent of its jeans to conserve energy. Outerknown is no slouch in the corporate-responsibility department, either. Besides backing its S.E.A. jeans with a lifetime warranty, meaning it’ll repair or replace any worn or torn pants for free, the brand will take back any castoff trousers for recycling so they end up as building insulation instead of in the landfill. 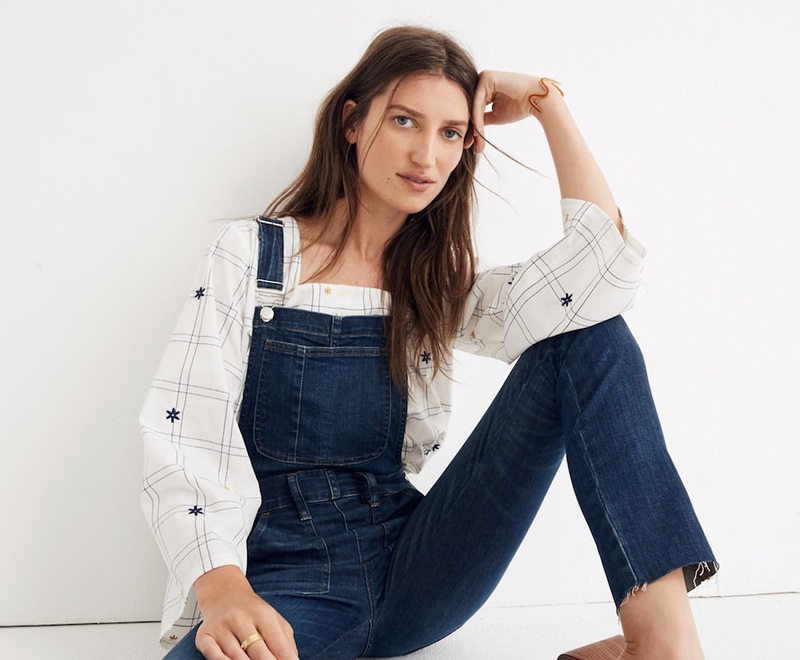 Madewell also opted to partner with Saitex (remember that name, you’ll be seeing more of it) for its Eco Collection of jeans, jackets and overalls, which it unveiled last month. Like Outerknown, J.Crew’s millennial sister-label clads its denim in organic cotton milled by Candiani. Unlike Outerknown? The dyeing process incorporates an ingredient derived from chitosan, a substance naturally found in the exoskeletons of crustaceans like crabs and shrimp—“i.e., stuff that restaurants throw out all the time,” Madewell asserted on its website. When Everlane dropped its three styles of legging-esque stretch denim in September, it unsurprisingly leaned on Saitex to do the heavy lifting. The digitally native brand already employs the factory for its rigid denim pieces, which have been perennial bestsellers since their introduction last year. While Everlane uses conventional, rather than organic, cotton, it touts Saitex’s eco-friendly bona fides as proof that its jeans are better for the planet. C&A stuck with organic cotton, however, when it came to developing what it has dubbed the “world’s most sustainable jeans.” Feted in August, the jeans are the first finished denim garment to receive the Cradle to Cradle Products Innovation Institute’s vaunted Gold certification. The Belgian-based retailer doesn’t work with Saitex but with India’s Arvind Limited, which uses biocompatible elastane, environmentally safe dyes and lower-impact threads to achieve the desired parameters. And for the most part, sustainable jeans are synonymous with organic denim, which can claim a cleaner, more natural provenance. Case in point: the activism-friendly Patagonia, whose workhorse Steel Forge denim couples 92 percent U.S.-grown organic cotton with 8 percent Dyneema, an ultra-high-molecular-weight polyethylene that some have hailed the “world’s strongest fiber” for surpassing even steel in durability. Instead of using toxic chemicals, Patagonia dyes the jeans using a bio-based dye derived from domestically grown natural indigo. The Steel Forge pieces are cut and sewn in California, further rooting the jeans in their all-American identity. Indeed, “made in the U.S.A.” can give denim an additional eco-adjacent gleam. Shorter travel distances mean fewer greenhouse gases get pumped into the atmosphere. Compared with developing countries, American laws boast fewer regulatory loopholes and stronger environmental and labor protections. Plus, supporting homegrown workers just feels patriotic. American Giant’s freshly minted men’s jeans ticks all of those boxes. It sources denim fabric from Georgia’s Mount Vernon Mills, then cuts and sews it into pants in Los Angeles. Sanding is by hand, not through abrasive blasting. And the company’s schtick is making durable products that stand the test of time and trends. Sounds pretty green to us.